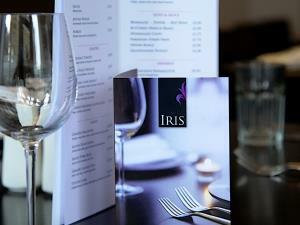 Iris Restaurant01924 367683work Restaurant - EnglishIris is a contemporary British restaurant located in the heart of Wakefield city Centre, close to the Cathedral and the Bull Ring fountains. Set up by chef Liam Duffy in 2012 the 50 Cover restaurant was refurbished to create a modern dining experience. Iris is a contemporary British restaurant located in the heart of Wakefield city Centre, close to the Cathedral and the Bull Ring fountains. Set up by chef Liam Duffy in 2012 the 50 Cover restaurant was refurbished to create a modern dining experience. After working in some of the countries top michelin starred establishments Liam decided to bring his own brand of fine dining back to his roots. Teaming with top local suppliers such as Allums Butchers Wakefield and Shepards Fish in Doncaster. Iris creates modern British cuisine to excite everybodys taste buds with a relaxed dining experience using modern cooking techniques and sourcing local seasonal produce of the highest quality to create a unique menu.